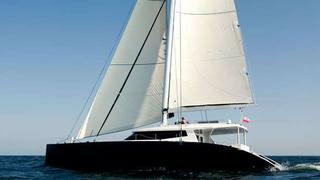 Sunreef has delivered its first 80 Carbon Line sailing catamaran superyacht Levante. Launched in July, 24.38m Levante is designed for high-performance sailing and can reach speeds upwards of 20 knots. Her lightweight construction in advanced composite sandwich combining vinylester, PVC foam and carbon/glass fibre with a carbon mast and boom and standing rigging with Kevlar adds to her performance capabilities. Levante weighs in at just 45T lightship and 60T fully loaded. Levante's European owners plan to cruise from the Mediterranean to the Caribbean and then across the Pacific to the Indian Ocean. She will make her world premier to the press and public at the upcoming Cannes yacht show.